It’s a glorious morning in Venice. I know it is because I can see sunlight out the window of the plane as we approach Marco Polo Airport. I catch my breath when I spot the campanile in Piazza San Marco rising high above the skyline and the dome of the Salute church at the far end of the Grand Canal. The island is beautiful from a distance, but also small, like a tilt-shift photograph that renders the cityscape in miniature. My flight lands on time and before long I’m stretching my weary legs on the long walk out to Pier 14 where there’s a water taxi waiting for me. This is a great indulgence of mine—I’ve always taken the bus before—but after all that’s happened in the last few weeks, I figure I deserve a break. As the boat pulls away from the dock, I sink back into the seat and exhale deeply. At the touch of a button, the driver retracts the tinted roof and I close my eyes as rays of morning sun warm my face. We gather speed as we make our way across the lagoon, and as the boat begins to skip across the choppy waves I can feel a fine salt mist on my skin. I had left my luggage upright on the floor of the cabin and now it’s starting to slide slowly on its wheels, back and forth. 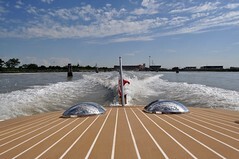 We enter Venice proper through a square of open water in the sestiere of Cannaregio, near Fondamenta Nuove and the 14th century church of Madonna dell’Orto, and from there head south towards the Grand Canal. It’s just a short distance to San Stae and there the driver makes one final turn and pulls up to the water entrance of the Hotel al Ponte Mocenigo. I’ve stayed here before—twice, in fact—but I’ve never arrived in such grand style. Walter greets me warmly at the door and hoists my luggage out of the boat. It’s still early in the day, just 10:30 AM, so my room isn’t ready, but he invites me to sit for a while in the hotel’s courtyard and kindly offers to bring me a cappuccino. I feel exhausted from the flight and more than a little seasick from the bobbing of the water taxi. At the same time, though, I’m exhilarated to be here and comforted by the sight of familiar surroundings. I leave my luggage behind and walk out the gate, following the signs that point to Alla Ferrovia and Piazzale Roma. It’s a pleasant walk through tiny alleyways and along quiet canals. I’m heading to the train station to buy an ACTV pass for the vaporetto and a Venice Card to cover my admission fees to a wide range of museums and churches. I’m trying to be optimistic about what I’m able to do. It’s noon by the time I return to the hotel and my room in the Annex is waiting. 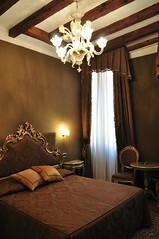 It’s a lush space, with an open beam ceiling, dark silk walls, a carved headboard, and damask bedspread. High overhead there’s a Murano glass chandelier and I stare at it as I lay back and rest for the next two hours. I’m still not feeling well and I need to pace myself. It’s 2:00 PM by the time I venture out again in search of a late lunch. I stop at Ostaria al Garanghelo and order a plate of ravioli with a sage butter sauce that tastes good, but settles hard in my stomach. There are two young women sitting at the table next to mine and I amuse myself by listening in to their conversation. One hands her phone to the other and says: “Look, you got a picture of that famous house and whatever.” Sophisticated travelers they are not. 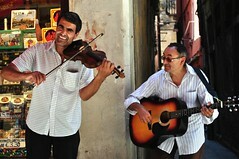 Soon, however, their inane commentary is drowned out by two street musicians who settle in across the street. With a guitar and violin they smile widely as they play “Cheek to Cheek,” an Irving Berlin tune from the 1930s that has me envisioning Fred Astaire in white tie and tails with the lovely Ginger Rogers in his arms. When we’re out together dancing, cheek to cheek. With no particular destination in mind, save one minor errand, I wander down across the Rialto Bridge to a Vodaphone shop, where I wait in line to buy a SIM card with a data plan for my iPhone. I press on, all the way to Piazza San Marco, where at long last, restoration work on the base of the campanile has been completed, freeing the square of five years worth of fences and construction debris. It’s been a nice afternoon, but my legs are tired and I’m ready to head back on the vaporetto. I’ve been to Venice twice before, and as the water bus passes the colorful and crumbling palazzos that line the Grand Canal all the way back to San Stae, I think about how this releases me from the burden of expectations. I’ve seen nearly all of the major sights and tourist attractions in town—St. Mark’s Basilica, the Doge’s Palace, the Accademia museum, and the Bridge of Sighs. I’ve been out to the islands of Murano, Burano, and Torcello, and to San Giorgo Maggiore with its majestic views of the city proper. With so few boxes left to tick, my time is my own, to wander and explore, and I’m quite looking forward to it. By the time I leave the hotel at seven in search of dinner, the deep blue of the afternoon sky has given way to a brooding canopy of gray. A light rain is starting to fall as I slide into a comfortable seat at Trattoria al Ponte, just around the corner. 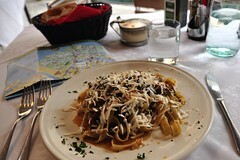 I sit and relax through a bowl of bean soup and a fine plate of tagliatelle with tomato, eggplant, and smoked ricotta cheese. I had hoped to go back to Piazza San Marco tonight to listen to the orchestras play, but the gentle patter of raindrops on the awning overhead tells me it would be best to tuck in early for the night. Venice may be sinking, but it will still be here in the morning.